Commercial modular construction firm Ramtech Building Systems of Mansfield, TX is set to highlight three new modular buildings that are now fully operational for use at the Scoular and Stovall Halls Occupant Relocation Project located on the main campus of the University of North Texas in Denton, Texas. 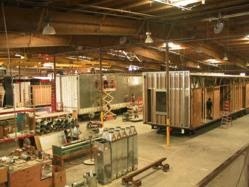 Developed to make way for a new $130 million University Union which began construction in June of this year, the 37,778 square foot modular school building project will be part of a specialized marketing campaign to promote the speed and versatility of relocatable modular construction to the university and college market. The modular school buildings that make up the $3.5 million project were purchased through the Texas Buyboard purchasing cooperative and provide a total of 37,778 square feet which was used for the relocation of three of the University's high profile programs. The installation of the prefabricated sections for each of the three facilities were substantially completed prior to the end of August, which allowed the University to move into the buildings prior to the start of the 2013-2014 academic school year. Both the Stovall and Scoular Halls will eventually be demolished. With an enrollment that is now over 35,000 students, UNT's current union, built in the 1960s, was only designed for a campus population of 17,000. The University expects the new union to play an important role in enhancing enrollment recruitment and retention, along with providing the faculty and staff with a facility capable of hosting conferences, professional seminars and events that can enhance the academic reputation of the college. The manufacturing phase for each of the three modular buildings was completed in April and May of this year. Ramtech provided design assistance to Jacobs Engineering Group, the architect for the project, and worked closely with The Beck Group, the construction manager that provided the site built structures which connect to the modular buildings at each location. The buildings are spread across two locations, with the first site housing the University's College of Visual Arts and Design as well as the Department of Counseling and Higher Education programs. Both of these facilities include standard and specialized spaces for classrooms, studio lab teaching spaces, work rooms, conference rooms, and faculty and staff offices. The Fibers and Fashion building also includes a climate controlled vault space for up to 20,000 pieces of the Texas Fashion Collection, while the counseling building provides for specialized monitored clinical rooms. The second site accommodates the Department of Dance and Theater Arts and includes space for a student reception area, conference room, instrument storage, faculty and staff offices, four large dance rooms, and a computer lab. All of the buildings were installed on poured foundations and use a HardiePanel stucco embossed exterior painted to match the surrounding area, while the interiors utilize vinyl covered gypsum walls and a combination of vinyl composition tile and commercial grade carpet on the floors.